Black Ice Software - BiBatchConverter version 4.04 is released! BiBatchConverter version 4.04 is released! Added AutoCAD printing, improved printing for large HTML documents, improved file name generation and more! 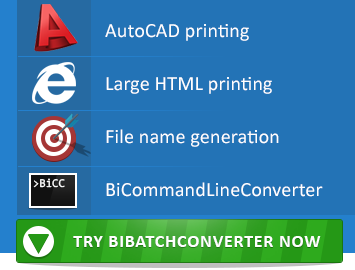 Black Ice Software has released BiBatchConverter version 4.04 which includes new AutoCAD printing, improved printing for large HTML documents, improved file name generation to save the printed documents as the same name as the input source documents, improved installation with automatic spooler restart to enhance reliability, and dozens of more improvements. Version 4.04 of BiBatchConverter with the updated Printer Driver includes improvements for the Mail Merge feature, stability improvements for printing very large HTML documents, PDF documents with Asian characters, and improvements for filename generation when printing PDF or Visio documents. The updated BiCommandLineConverter can be used with an abbreviation by simply typing BiCC instead of BiCommandLineConverter.exe to start a conversion. Do not forget to subscribe to future releases by purchasing maintenance. With an active maintenance subscription, you will receive all new releases for free! Priority email technical support is also included in your subscription. For more information, call us at +1 (603) 882-7711 Extension 3, or impactsales@blackice.com.